Nickie is my baby. She is the only dog that I’ve ever considered my own. The others in my life were jointly shared with family. But Nickie stole my heart when I saw her, a six-week old, two pound puppie, with the sweetest little face and a tiny little body that could fit in my hands. We didn’t mean to get another dog. We had a Cocker Spaniel, Sable, who was getting older and wasn’t in good health. I had thought about getting another dog for our kids to bond with before Sable was gone, but as a family, we hadn’t really discussed the idea or made that decision. We were buying a Sheltie to give to my father-in-law for his 60th birthday. We located a breeder in our area who was going to have puppies ready to leave their mom about the time we wanted to present him with his new dog. The breeder had two, and we could choose the one we wanted to purchase. When we went out to pick up the puppy we were going to give, we walked in and saw two miniatures, tiny little dogs that were twins, the only two in the litter. One was more social, came out to see us right away. The other one seemed shy and quiet. My inlaws operate a Christian student center at a small college, so we thought the more outgoing pup would be the best fit for their environment. But even as we were making that choice, the other puppy was casting her spell. It was a short step from buying one puppy to taking both. Talk about an impulse purchase! We took both dogs home and settled into a puppy centered life for a while. My inlaws arrived for their visit, were completely charmed with the dogs, and when they left, they took the one we had chosen for them. We named ours Nickie, or Nicollette Ness Gibson. But she was Nickie, or Nick, from the first. Then as she captured my heart, she became “Little” and then “Poo,” additional names she still has to this day. Nick-names for pets are like names for your kids…you don’t always know or remember where they came from or when they were added. They’re just additional little names that show your affection. 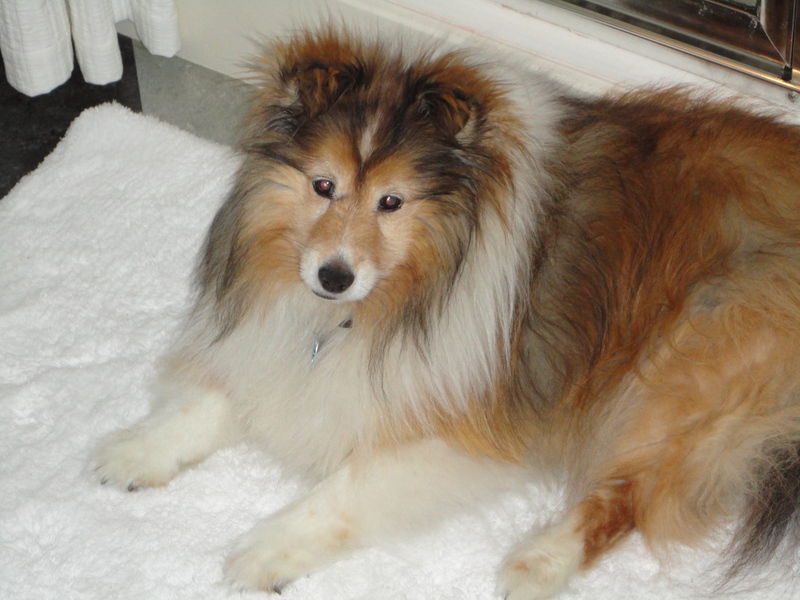 Nickie was a little puff of a dog with a fine coat of fur and a little pointed nose. She had quite the spirit when we got to know her. Shelties are sheep herding dogs, and it wasn’t long before she was nipping at my heels going up the stairs. I guess in the absence of sheep, she decided to herd the humans in her charge. She particularly loved Alex, and became attached to him. He spent a lot of time with her as we were home schooling him that year. She grew, but not much. Every time we talked with my inlaws, we compared the weight of the two dogs. I thought their vet’s scales must be out of sync with ours, there was a significant difference in the weights of the two siblings as they grew. We were astonished when we saw the two together several months later. Nickie was the runt. She had grown in size, and her fur coat had filled in, but she was only about half as big as her sister. It was really comical to see the two together, knowing that a few months before they had been the same size puppies. It was not from lack of trying that Nickie was small. She had (and has) a seemingly insatiatable appetite. I think she would eat until she popped if we didn’t limit her food. She’s very protective of her bowl too…get near her when she’s eating and she gets very agitated. We tried to correct that behavior, but never really got through to her. She’s still concerned, at every meal, that her bowl is in danger of being whisked away. She’s so ferocious that our Jack Russell, Pete, won’t even go into the kitchen when she’s eating. Nickie has been fortunate. She’s on her fourth life now. About a year after we got Nickie, Sable began to get weaker. She finally reached a point of not getting up from her bed, and we knew the time had come to say good-bye. I arranged for our vet to come to the house to put her down and we were all able to be there with Sable. It was a hard afternoon and a sad evening. Just before bed, we were letting Nickie out for the last time before going up for the night. A herd of deer were just beyond our door and Nickie ran over to them, attempting to herd them. As we watched, she followed them up the hill in the darkness. She had never run before, we had let her out without a leash, and because she had recently been chewing at her collar tags, I had taken her collar off to try to stop that behavior. I was frantic, realizing that she was out at night, in the Colorado cold, with no collar to identify her, and could possibly be prey for whatever predators were nearby. We knew there were mountain lions in the area, and she was small enough to be an easy target for almost any size animal. We looked for her without success, then left the garage door up and the light on, hoping she would find her way home. The next morning she was still missing. I couldn’t really believe she would have survived the night, but we decided to call the vet offices and shelters in the area in case she had been found by someone else, and we continued our search in the daylight. By late afternoon I felt hopeless. Our daughter decided to contact some shelters further from the house, and by some miracle, a shelter several miles away had a call about a dog that matched Nickie’s description. They gave Stephanie the contact information for the person who had reported finding her, and she arranged for Nickie to be brought to the house. Nickie had roamed about a mile and turned up at someone’s back door. Seeing her safe and at home again was such a relief. I had felt so terrible, both for Nickie to be lost, and for our kids, losing one dog to illness, and having the other one run away in the same day. Her next near-death adventure occured in the Arctic. We took the dogs with us when we moved to Kotzebue, Alaska, in our empt nest adventure. We were living in an apartment building, reserved for hospital staff with pets, appropriately enough known as the “Dog House.” Rob and I had planned to travel to our son’s graduation from Army basic training, and I had arranged to trade dog sitting with one of the nurses at the hospital. Our dogs were going to stay with her and her two larger dogs, and I was going to return the favor when she was out of town. We had a meet-and-greet, and everyone seemed compatible. The morning we were leaving, I took the dogs to the house where they were going to stay while we were gone. It was November, already dark and cold in the Arctic. I went home to finish packing and had barely walked in the door when my phone rang. The nurse who was keeping the dogs called to say that one of her dogs had bitten Nickie and she was bleeding. I ran back to get Nickie and when I walked in the door, saw blood all over the walls of the front entrance. Nickie had been bitten on the back of her neck, and it looked like she was bleeding profusely. We rinsed off the blood to see the extent of the damage, and saw that in reality, she only had a small bite. I scooped her up and took her home and waited for Rob to come back from his hospital rounds. There was no vet in town, and I thought she needed a few stitches. Rob was the stand in vet in the emergency. I held a flashlight and he used a sewing needle and black thread to put a few stiches in to close the bite wound. A neighbor agreed to keep her so she would not be staying with the dog who bit her. Although she seemed a little dazed and disoriented, she recovered well, and by the time we got back from our trip, was her old self again. But she almost didn’t survive that year. A few months later, her appetite was almost the end of her. One evening after work, I was beginning dinner and noticed a couple of bites of steak in the fridge that I had saved as a dog treat. I gave Pete and Nick a bite each, and then turned around to continue my dinner prep. But within seconds I could hear Nickie wheezing like she couldn’t breathe. She had choked on the bite of steak I gave her and was gasping for air when I looked down. I couldn’t dislodge the meat, and realizing she wouldn’t last long, I ran next door to get help. Our neighbor, Jimmy, was a Santa Claus look alike who was the department head of X-ray at the hospital. I had the inspired thought that he might be able to dislodge the meat with his better knowledge of anatomy. The moment he opened the door and realized what was happening, he took Nickie and began to try to save her. He was able to extract the meat, and then he actually gave her a few breaths of mouth to mouth to bring her back around! And what did she do? As soon as he put her down on the floor she began to look for the bite of meat that had fallen when it was dislodged. Fortunately for her, I beat her to it, and she didn’t get any more steak for a long time. We eventually had a nice dinner party to thank Jimmy for saving Nickie. Nickie was introduced to everyone, but she was not invited to eat. She’s still a chow hound, and she’s broadened with age, although she’s still a small dog. She turned 11 this year in November. Hard to believe we’ve had her this long. She’s still a feisty little being, still loves her food, and she would still like to herd sheep. Nickie has been a joy in my life. She reminds me that good things come in small packages, and that you can outgrow shyness and overcome size to take your place in life. I love her little ferocious spirit, and her funny little ways. She’s my baby.